Back in the early 90s, I was head of marketing for Gallery 500 – an automotive art gallery and museum based just north of Toronto. I spent a considerable amount of time everyday coming up with events and activities designed to expose the gallery to a global audience of automobile and race fanatics. 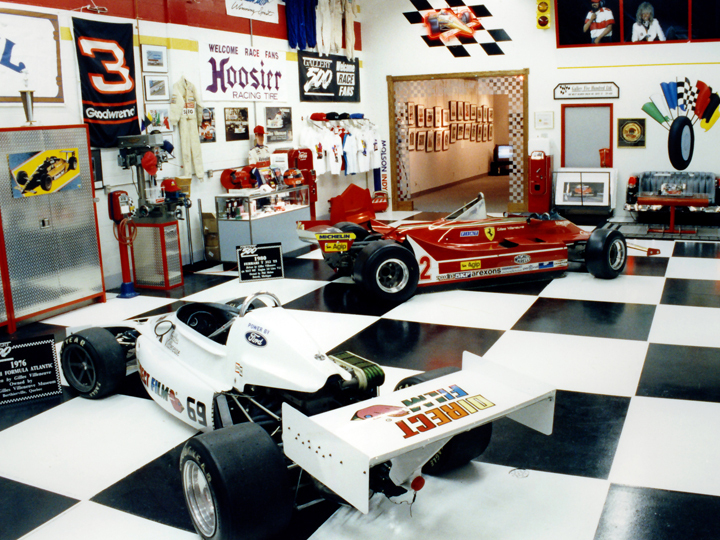 One of our successful major events included a fund-raiser for the Gilles Villeneuve Museum in Berthierville, Quebec. We had teamed up with them, got some great memorabilia, as well as some cool things from other supporters. We had Gilles’ helmet and suit, Formula 1 trophies, his Direct Film Formula Atlantic car and a Ferrari T312T5 F1 car. We would have a kick-off event and sale with a portion of proceeds going to the museum. Erik Tomas and Raceline Radio did a live remote show from the gallery. It was cool and we raised some money. The exhibit would run for three months or so and then would move to the Toronto Auto Show. 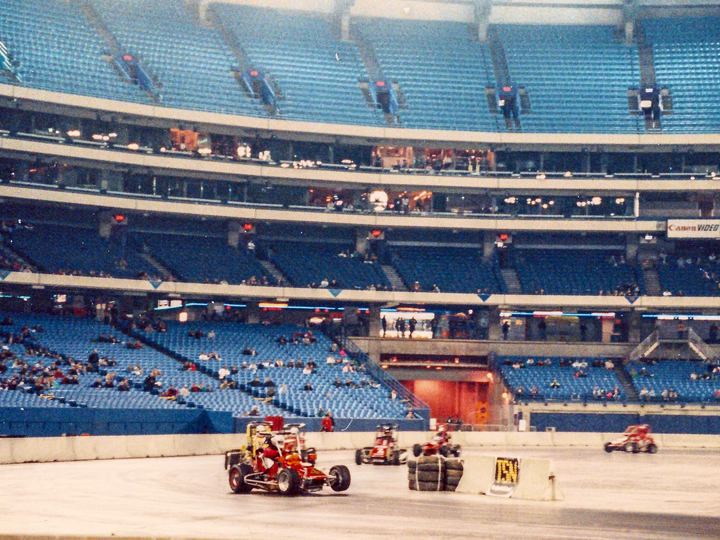 Somewhere during the run for the exhibition at the Gallery, the USAC midgets were scheduled to come to the Skydome. 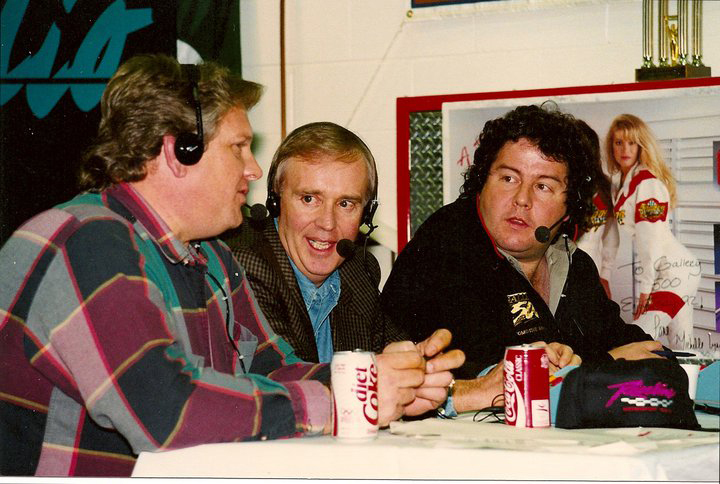 The radio promos talked about Kenny Schrader, Tom Sneva and other open-wheel stars – plus – Chris Economaki would be doing the on-event play-by-play announcing of the event. Cool! 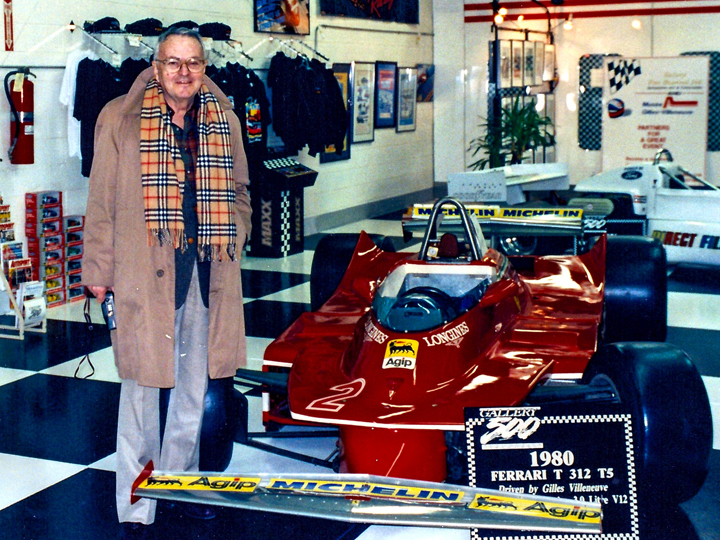 Chris Economaki encounter # 1 – With the knowledge that Chris was coming to Toronto, I came up with a plan. I called his office and simply offered to pick him up at the Toronto airport and drive him to his hotel. I told him that we’d be driving right past Gallery 500 and that I had a bunch of Gilles Villeneuve memorabilia that I just knew he’d like to see. My goal was to get some coverage in his column in National Speed Sport News. So, he cautiously agreed…. but he agreed. So, fast forward… I pick him up and we head westbound on the 401. Try as I might, I could not engage him in any conversation. I think that if he would have said anything, it would have been “Don’t talk to me”. Might have been the mullet? Anyway, as we were coming up to the DVP, he finally spoke…. “Why the hell do all you Canadians drive with your damn headlights on during the daytime? ?” And for those of you that know Chris, read that quote as if he is saying it to you – doesn’t that just sound like him? Awesome. I discuss the concept of daytime running lights – just like Sweden I explain – and we resume radio silence. We get to the gallery, and he finally engages me. He asks lots of great questions. As a lot of you know, he always carries a camera and he snaps a bunch of pics. I ask him for a picture of him beside the Ferrari and he happily obliges. On the drive to the hotel, we’re best buddies… finally! We’re discussing family, Canadian beer, hockey, AJ Foyt, daytime running lights and of course, Linda Vaughn. 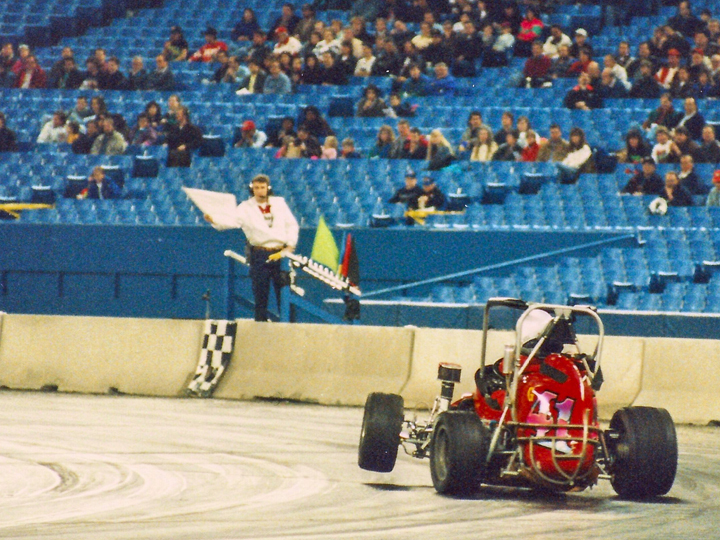 The USAC midget event comes and goes and that’s that. A few weeks later, Gallery 500 gets a great pop in his column – mission accomplished! Chris Economaki encounter # 2 – About 7 months later, at the Speedway Club at the Charlotte Motor Speedway, an event took place to announce the “Driver of the Quarter Century”. There were 10 nominees including RICHARD PETTY, A. J. FOYT, DON GARLITS, DALE EARNHARDT, DAVID PEARSON, DARRELL WALTRIP, CALE YARBOROUGH, AL UNSER, RICK MEARS – and the winner – MARIO ANDRETTI. Most of these guys, if not all – were there. Gallery 500 was a ‘table sponsor’ for the event and as such, I was fortunate enough to attend. Prior to the formal proceedings, the bench racing and cocktails were flowing. And then, you know what happens when that someone special enters a room? People stop talking, glance over, point and nod their approvals and admiration. You guessed it…. Chris Economaki had arrived. By plain dumb luck, I was right at the door as he had entered. I approached him like anyone who approaches an “old friend”. “Hey Chris… it’s me… Jim Bowie” I enthuse – but get nothing in return. “From Gallery 500 in Toronto…. Remember?” I ask, less enthused. “Oh…. Yeah….. Right…. Yeah…. (long pause, looks me over)”. Just when I think it’s coming back to him, he says…. “Yes Sir Mr. Economaki”… and I was damn proud to do it! Chris is 91 now and I hope that someone writes a book about him one day. I just cannot imagine the stories. There will never be another like him. Thanks for everything Chris Economaki! This entry was posted in Good times! and tagged "Formula 1", Atlantic, Economaki, F1, Ferrari, Formula1, Gilles Villeneuve, motorsports, National Speed Sport News, NSSN, Raceline, Skydome, USAC, Villeneuve by Brandrenaline, Inc.. Bookmark the permalink.